Waseda Jitsugyo’s Kotaro Kiyomiya homers to lead off the fourth inning of Monday’s quarterfinal game against Kyushu International Univ. High School at Koshien Stadium. The Yomiuri Shimbun　NISHINOMIYA, Hyogo — First-year phenom Kotaro Kiyomiya added to his budding legend at Koshien Stadium by homering in his second straight game. Teammate Naoki Tomita helped assure the fans will be seeing more of the young Waseda Jitsugyo slugger. 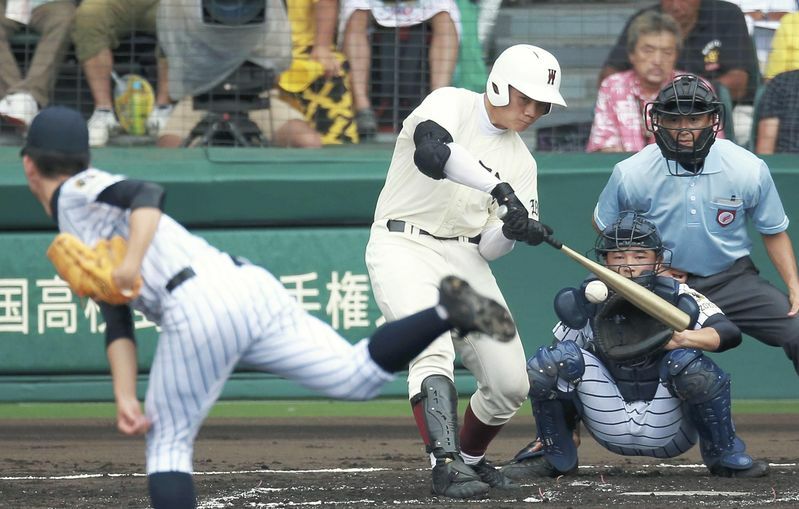 Tomita hit a pair of two-run homers as Waseda Jitsugyo defeated Kyushu International Univ. High School of Fukuoka 8-1 on Monday to advance to the semifinals of the National High School Championship. The West Tokyo school will face Miyagi’s Sendai Ikuei on Wednesday for a place in the final. Sendai Ikuei kept its title hopes alive by beating Akita Shogyo 6-3. Kiyomiya homered to lead off the fourth. Unlike his towering shot in the third-round victory over Tokai Univ. Kofu, he drilled a low fastball inside the right field pole. With seven RBIs in the previous three games, Kiyomiya knew he was a marked man. In his first at-bat, he was pitched tightly inside and made an easy out. But in his next trip, he jumped on a hittable pitch. Tomita hit his first two-run homer in the second inning, then added the second when Waseda Jitsugyo struck for four runs in the fourth. Kyushu’s Hayata Uto broke up the shutout with an RBI single in the seventh, but Waseda responded with two runs in the bottom of the inning. The two other quarterfinals featured dramatic finishes. Naruki Sugizaki doubled in the winning run in the bottom of the ninth to give Kanagawa’s Tokai Univ. Sagami a 4-3 win over Saitama’s Hanasaki Tokuharu, while Kanto Daiichi of East Tokyo beat Okinawa’s Konan 5-4.